The Sydney, Australia, Tramway System. This article, from The Electrical World and Engineer, December 6 1902, describes the New South Wales Government Tramways in Sydney. THE first electric tramway to be operated in Sydney was installed about 1890, and resulted from the conversion of a short steam line between Randwick and Waverly, which could not be made to yield a profit when operated with steam. This experiment was, however, soon discontinued, and the electrical apparatus removed to North Sydney, and erected at the terminus of the cable system as an extension of this system to Middle Harbor. The next development in the electric traction system of Sydney was the extension of the Ocean Street cable tram as far as Rose Bay. This extension skirts the shores of Sydney Harbor, giving to passengers a view of a beautiful bit of scenery, and from an engineering point of view is remarkable for its steep grades and sharp curves. It is doubtful if any other source of power than electricity could have been successfully employed on this extension. The power was furnished by two 150-kw General Electric six-pole dynamos running at 400 r. p. m., and belted to the engines used for operating the cable cars. 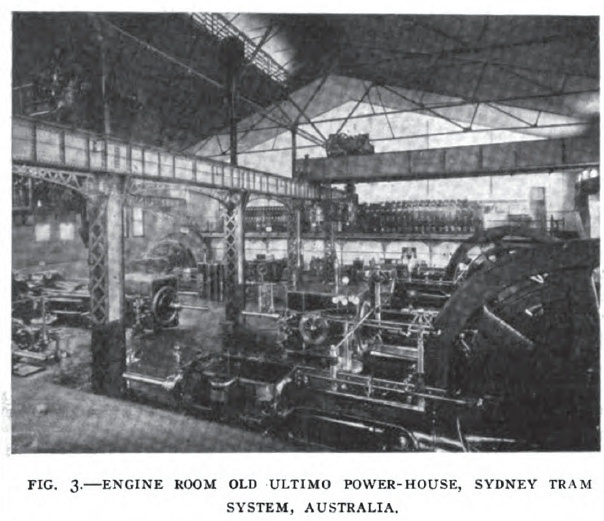 In 1898 the first electric power plant of any size in Australia was built at Sydney, and known as the Ultimo power house. The current generated at this power house was to be used for operating the trams on George and Harris streets, in the center of the business section of Sydney. Before this time, and with the exception of the short electric trams mentioned above, and the cable trams at North Sydney and Ocean Street, transportation to the various sections of the city was had mainly by means of steam trams, which not only proved very noisy and dirty, but were expensive to operate. The conversion of these steam trams to electricity was kept in mind when the Ultimo power house was designed, and it was built with the idea in view of increasing it to a size sufficient for supplying the entire system, steam trams as well. While this article deals mainly with the large new power house just built, a brief description of the original one will probably prove of interest. It is situated close to the tracks of the Government railways and only a short distance from the shores of Darling Harbor, from which a supply of salt water for condensing purposes is obtained. The building is of brick and steel construction, and arranged with the offices in front, and the engine and boiler rooms side by side behind the offices, thus allowing of their future extension. The engine room is 120 feet long and 96 feet wide; the boiler room being 120 feet long and 84 feet wide. The latter is provided with fourteen multitubular 300-hp hand-fired boilers, built by a local firm. Each boiler is 16 feet long and 7 feet in diameter, and has 72 tubes, 4 inches in diameter. The boiler settings are fitted with hot-air economizers. 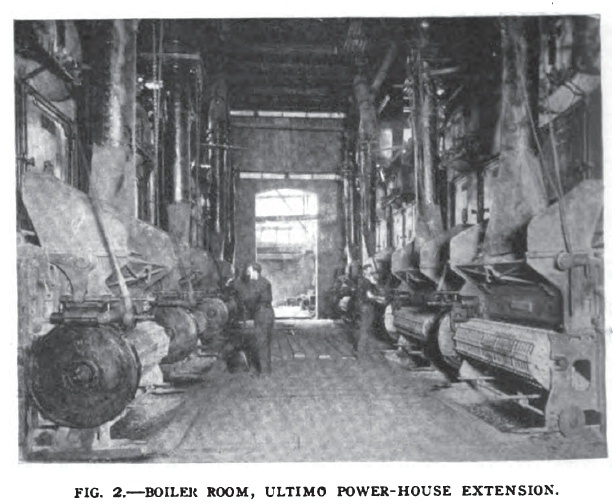 The engine room contains four 850-kw generators, direct connected to cross-compound horizontal engines built by the E. P. Allis Company, of Milwaukee, and arranged in two rows down the engine room. The engine high and low-pressure cylinders are 26 inches and 48 inches in diameter, respectively, with a 48-inch, stroke, and their speed is 100 r. p. m.
They are alternately right handed and left handed, so that one condenser may serve for two engines. The generators are of the General Electric railway type, compound wound, and need no description. The flywheels are of the compound type, reinforced with steel plates, and weigh about 40 tons each. Blake centrifugal circulating pumps and Blake three-throw plunger feed pumps, all driven by 40-hp slow-speed motors, are located in the boiler room, while Blake steam-driven air pumps are used for the Wheeler surface condensers installed. The switchboard is located on a gallery at the end of the engine room nearest the offices, and was built by the General Electric Company. It is of that company's usual railway type, built of black enameled slate and consists of four generator panels, 17 feeder panels, 5 lighting panels, summation, booster and battery panels. The engine room is provided with two electric cranes built by the Case Manufacturing Company, Columbus, O., each capable of lifting 30 tons, the span of each crane being about 48 feet. Without even attempting the conversion of the steam trams to electricity, it was found that this station was almost immediately loaded to its utmost capacity. It, therefore, became urgently necessary to enlarge this power house and to provide the necessary new apparatus as soon as possible. As some of the steam lines extend for quite a distance into the suburbs, with consequent long feeders, the question arose as to the advisability of increasing the present direct-current installation, or of making an entirely new departure, and providing alternating-current apparatus. With this end in view, the Chief Railway Commissioner, Mr. Charles Oliver, made a tour of inspection around the world. While in the United States, and acting on the advice of Mr. M. G. Starrett, of New York, as well as that of his engineers in Sydney, he decided on a three-phase, 25-cycle, 6600-volt system, using substations with rotary converters and transformers, and in August, 1900, signed a contract with the General Electric Company for the entire station and substation apparatus (except three-phase cable and storage batteries), including the steam machinery, which latter, however, was rebuilt. This machinery has been installed in Sydney, and is now in successful operation. The general plan of the extension just installed is as follows: The original power house at Ultimo has been enlarged, and three 1500-kw generators with the necessary engines, boilers and other apparatus have been installed. Five substations have been built, one each at Newtown, Randwick, Waverly, Hunter Street and North Sydney. In each of these substations, with the exception of that at Randwick, there has been installed two 450kw rotary converters, six 175-kw air-blast transformers, and two 500 ampere-hour storage batteries, each provided with a 50-kw booster set for charging purposes. Randwick substation is known as a "single unit" substation, as it contains only one rotary converter and one storage battery. The plans of the new building known as the "Ultimo Power House Extension" were drawn by J. G. White & Co., of New York, and the building is almost an exact counterpart of the Ninety-sixth Street power house of the Metropolitan Street Railway Company, of New York City. The boiler room occupies two floors, one above the other, and the ground space occupied is 176 feet long by 84 feet wide. Two coal bunkers of steel construction, and capable of holding 2,500 tons of coal, are built directly under the roof, which is about 75 feet above the lower boiler room floor. Two chimneys have been built, each 224 feet high, and containing about 750,000 brick. Each top is covered with a cast iron cap weighing six tons, and made up of twenty segments. The engine room is separated from the boiler room by a brick party wall, and is 176 feet long by 96 feet wide. It is lofty and well ventilated, and has foundations built for six units similar to those about to be described. The whole building is substantially built of brick, with brownstone copings, and the roof is built of steel trusses covered with corrugated sheet iron, a monitor being built over the engine room for ventilation. The engine room is provided with an electric crane built by the Morgan Engineering Company, and having a hoisting capacity of 30 tons, with a span of 96 feet. It is of the box-girder type, provided with three G. E. railway motors and controllers for operating from a cage. It is also provided with electrical as well as mechanical brakes. The substation buildings are brick structures with brownstone trimmings, very effective red tiled roofs, and are divided longitudinally into two parts, one part containing the rotary converters, etc., and the other part the storage batteries, a double interlocking door preventing the fumes from the battery room penetrating into the rotary room. The battery room, which is 50 feet long by 40 feet wide, is in the double unit substations, two stories high, one battery being placed upstairs, and the other downstairs. The floor upstairs is covered with sheet lead, with the seams burned together, while downstairs the floor is of cement. The rotary converter room is 50 feet long by 30 feet wide, built in one story, with a monitor at the top. 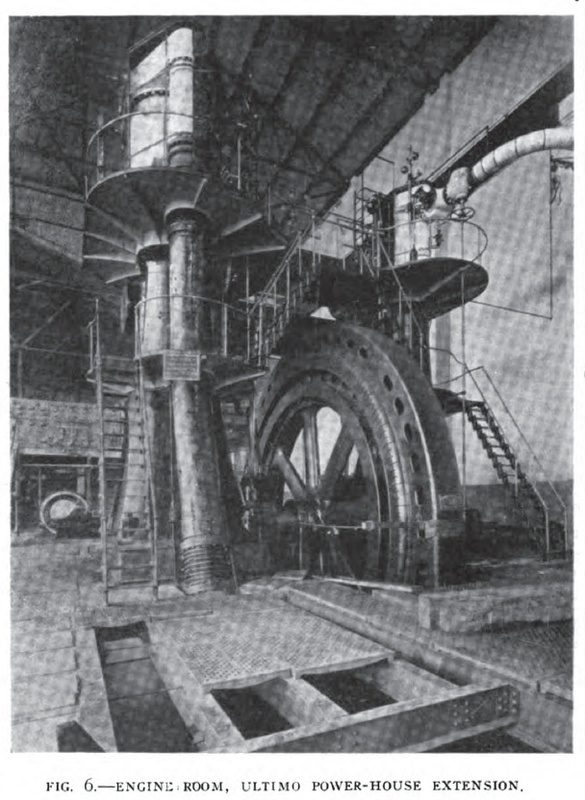 This room is provided with a five-ton traveling crane, built by R. S. Scruttin & Co., of Sydney, and is also provided with a still, heated by a gas burner, for distilling the water for battery use. The floor is of cement, and is tiled around each rotary for a distance of about two feet, thus giving a very finished appearance to the machinery. 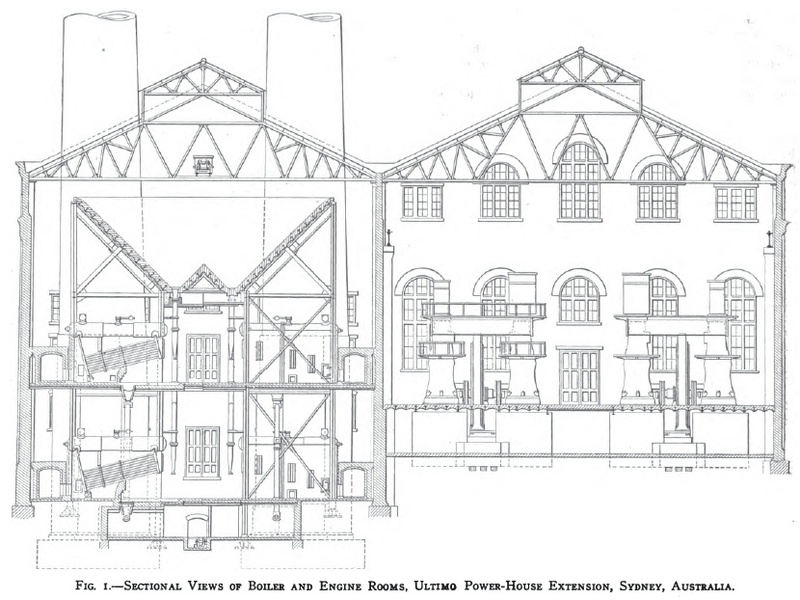 The boiler room contains 32 boilers, made by the Babcock & Wilcox Company, arranged to be set in batteries of two boilers each, eight batteries to be placed on the lower floor, and eight on the upper floor. Each boiler is rated at 450 hp, has 2,852 square feet of heating surface, and was built to operate under a steam pressure of 160 pounds per square inch. The front of each boiler is arranged for the reception of Babcock & Wilcox patent chain grate stokers. The coal is fed from the overhead coal bunkers by means of iron chutes, and feeds over the whole width of the grate, the thickness of the coal layer being regulated by the vertically sliding arrangement of fire doors. The stokers are operated by small engines connected by means of shafting and eccentrics. The John A. Mead system of noiseless coal and ash conveyors is in use, and consists, as is well known, of buckets mounted on wheels and operating on a steel trackway. The apparatus is operated by an electric motor, and includes a crusher operated by a second motor, and of 20 center dumping ash cars. The feed water is forced from the hot well through two Goubert horizontal secondary feed water heaters, directly into the boilers, by means of Worthington compound, duplex, outside-packed, plunger pressure-pattern boiler feed pumps. Three of these pumps are provided, each having two high-pressure steam cylinders 9 inches in diameter, and two low-pressure steam cylinders 14 inches in diameter; four single-acting outside-packed plungers 7 1/2 inches in diameter, all of 10-inch stroke. Each of the above pumps is guaranteed to deliver 240 gallons per minute when running at a piston speed of 52 feet per minute on each side. The two feed water heaters are each provided with 1,500 square feet of heating surface, and are arranged so that the exhaust steam from the boiler feed, circulating and air pumps will be carried through the heaters. The steam piping was furnished by the Best Manufacturing Company, of Pittsburg, and is laid out in accordance with the most modern ideas for combining simplicity with convenience and safety. Extra heavy piping and fittings were used, and ample provision was made for expansion by using wrought iron bends. The "unit" system has been employed, and the piping for each unit is as far as possible identical. The engine room is provided with three main engines built by the Allis-Chalmers Company, and placed in a row on the side of the room next to the boiler room. Each engine is a vertical, cross-compound condensing machine of the Reynolds-Corliss type, with high-pressure cylinder 32 inches in diameter, and low-pressure cylinder 64 inches in diameter. Both cylinders have a stroke of 60 inches, and operate at 75 r. p. m., with 150 pounds steam pressure. The steam from the boilers is led directly into a Reynolds separator placed in the basement, flowing from there into the high-pressure cylinder, and thence through a receiver and reheater into the low-pressure cylinder. A small motor is provided for controlling the speed of the engine within two per cent above or below normal, and is controlled by the switchboard attendant. Each engine is also provided with an auxiliary governor attached to a stop valve, located next to the throttle valve, and so arranged that should the engine from any cause speed up five revolutions above the normal, the valve will be instantly and positively closed, shutting off all steam from the cylinders. Two 150-hp horizontal tandem compound engines made by the Harrisburg Foundry and Machine Works, operating at 270 r. p. m., and each direct connected to a six-pole, 100-kw, 125volt, compound-wound generator, are located between the main engines and the high-tension switchboard gallery. These engines are equipped with an automatic self-lubricating device, whereby the bearings on the engine frame, crank pin, crosshead pin and guides, will be lubricated from a reservoir of pure oil, which constantly seeks its level, in the engine base beneath the crank pin. The crank delivers the oil from this reservoir in a continuous supply to the crank pin, from which it is thrown off by centrifugal force into a pocket provided in the inside of the oil hood, and from this pocket flows through tubes to the crank shaft bearing and thence back to the reservoir. Each main engine is provided with a Worthington surface condenser, which, together with its air pump, is located in the engine basement close to its respective engine foundation. Each condenser has a total of 3,600 square feet of cooling surface, and is guaranteed to produce a vacuum of 26 inches of mercury. Adjacent to the condenser is located a Worthington vertical compound beam air pump, having its steam cylinders of 9 inches and 16 inches diameter, and its air buckets of 20 inches diameter, with a common stroke of 12 inches. The circulating pumps are placed in the boiler room, and are of the Worthington horizontal compound, outside packed plunger type. The salt water used for condensing purposes is pumped from Darling Harbor, and the piping is so arranged that any circulating pumps can supply any condenser with cooling water. The two condensers for the exciter engines are similar to those for the main engines, except that they are smaller and are provided with combined air and circulating pumps attached to the same steam cylinder. A gravity oiling system is provided for the main engines. Direct connected to each of the three Allis engines just described is a General Electric 1,500-kw, 6,600-volt, three-phase generator, running at 75 r. p. m. These generators have their armatures stationary, while the field poles are attached directly to the periphery of the engine fly-wheel, thus making a very compact generating unit and reducing to a minimum the weight on the engine shaft. The fly-wheel hub and spider is a casting in two parts, and the hub is fastened to the shaft by means of six long bolts through the hub, and tightened in place while hot. The rim is made up of eight cast-steel segments, four of which are equal to the circumference of the wheel, the other four being placed beside the first four, but arranged to break joints. Forty field poles, which at 75 revolutions, will give a frequency of 25 cycles, sre bolted to the outer face of the engine flywheel rim, the bolts passing right through the rim of the wheel. Exciting current is led by means of two cables fastened to one of the spider arms, from the collector rings on the shaft to the field winding. The stationary armature is divided into four parts for convenience of shipping, which are bolted together as they are assembled. The internal diameter of the armature when assembled is 280 inches. The coils are rectangular in form, wound on forms, and placed in the slots as the armature was assembled in the Ultimo power house. The switchboard is located on a raised gallery across the dynamo room, between the old and the new portions of the station. Space is provided on this board for controlling three exciters, two of which are now installed, six three-phase generators, three of which are at present installed, and five substation feeders, all of which are now installed, although as they are at the end of the board, future feeder panels can be installed without disturbing the rest of the switchboard. There is also an exciter summation and a generator summation panel. The instruments and low-voltage controlling apparatus are mounted on blue Vermont marble panels, while the high-tension parts, consisting of switches, busbars and transformers are placed some distance behind the operating board. Each generator and feeder is controlled by three oil switches, all three connected to a common shaft, which is operated by a lever from the front of the operating board by means of rods and bell cranks. Each of these oil switches is placed in a separate brick comparment, so that any arc which may be accidentally formed in one compartment cannot be communicated to the others. All of the generator switches are provided with reverse current relays, which light up a red lamp on the front of the board should any reversal of current take place, but do not trip the switch, as this is not thought advisable. All of the feeder switches are provided with overload relays, which in addition to tripping the switch, should the current rise above a predetermined amount, also light up a red lamp on the front of the board, thus drawing the attendant's attention to this switch. Each generator panel is provided with a recording and an indicating wattmeter, a main ammeter and voltmeter, and a field ammeter. Each feeder panel is provided with a recording wattmeter and three ammeters, one for each phase. The generator summation panel is provided with one recording wattmeter, three ammeters and three voltmeters, thus showing the grounding or unbalancing of any phase. Two indicating wattmeters are also provided, enabling the instantaneous power factor to be determined. All of the ammeters, voltmeters and indicating wattmeters are of the General Electric horizontal edgewise type, with black enamel finish, while the recording wattmeters are of the round pattern, balanced induction type. Synchronizing arrangements are provided, using both a voltmeter and a lamp, the generators being in exact synchronism when the lamp is dark and the voltmeter reads full voltage. The exciters are provided with astatic ammeters and voltmeters, while the exciter summation panel is provided with a Thomson recording wattmeter. Both the exciter and generator field rheostats are placed in the basement, and controlled by means of a long shaft with gearing. All parts of the boiler and engine rooms, engines, switchboard gallery and offices are provided with telephones and signal lamps, all under the immediate control of the switchboard attendant, while he also has communication with each of the substations by duplicate telephone lines. Each of the various substations is electrically connected with the switchboard at the Ultimo power house by means of a duplicate set of three conductor cables furnished by the British Insulated Wire Company. The system in use is the solid laid system so common in Europe, and the cables are placed in wooden troughs and surrounded by an insulating material. Two wooden troughs made of well seasoned iron-bark, an Australian hardwood, which were coated with Stockholm tar, were placed in a trench dug to a depth of about three feet below the surface of the street. One of the troughs, in which the high-tension and 600-volt feeder cables are laid, is about 8 inches deep by 11 1/2 inches wide, while the other trough intended for the return cables is 5 inches deep by 6 inches wide. The cables when laid are supported by bridges of wood, and surrounded by a compound, composed of Stockholm tar, resin and sand, the trough being then covered with an iron bark plank, held in place by three layers of common brick. Each phase of the three conductor cable is composed of 19 No. 16 B. W. G. wires (equivalent to about No. 4--0 B. & S.), stranded together and insulated with 7/32-inch paper, the entire three conductor cable being covered first with 6/32-inch paper, then with lead, and outside of all with impregnated jute. 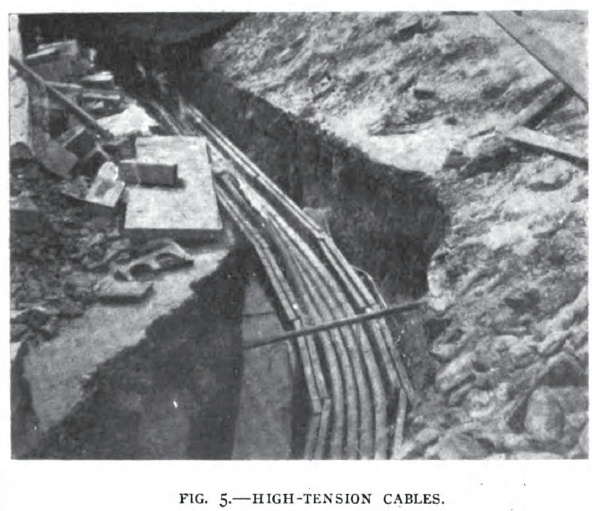 The section of the cable running to the North Sydney substations is laid under the waters of the harbor, and this cable is armored in addition to the covering stated above, with two layers of No. 11 S. W. G. steel wire, and outside of this with a covering of impregnated jute. Wirt alternating-current short-gap lightning arresters are provided, both at the Ultimo and substation ends of each duplicate feeder, for taking care of any electric surgings which may be set up in the feeders due to sudden heavy changes of load, or short circuits. 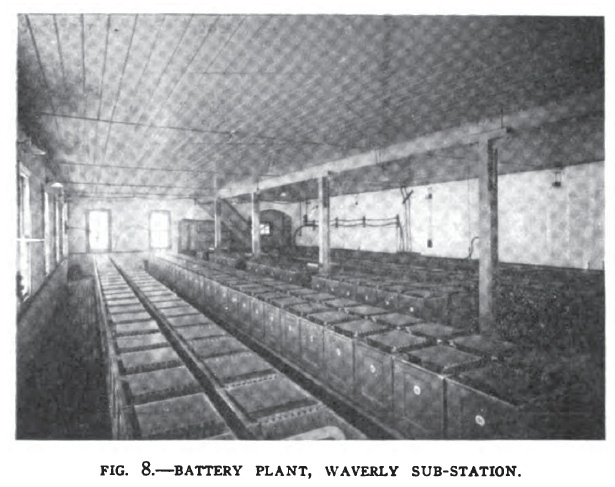 As all of the substations are identical a description of the Waverly substation, shown in Fig. 4, will suffice for all. 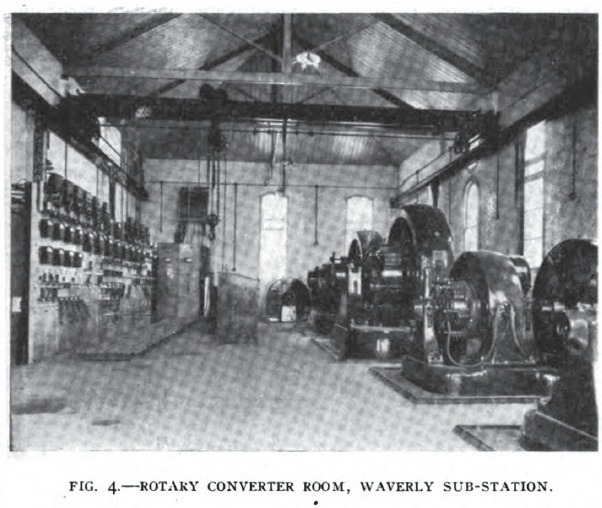 As stated above, the rotary converter room is provided with two six-pole, 450-kw rotary converters running at 500 r. p. m.
These machines are of the G. E. railway type, and are too well known to need description, except to say that they are provided with four-pole 40-hp induction starting motors. The rotor of these motors is forced directly on an extension of the main armature shaft, and is of the squirrel-cage type. 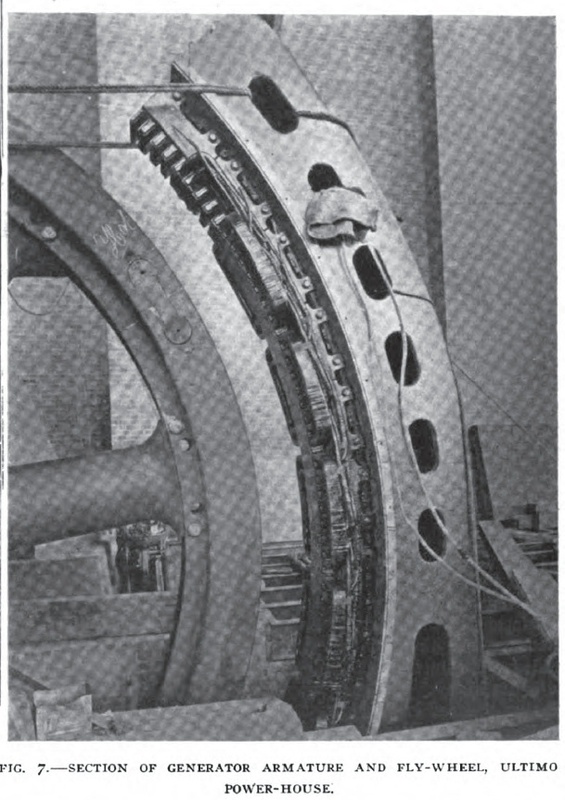 The stator is mounted on a bracket, which is bolted to the pillow block on the collector ring side of the machine. The 6,000-volt currents upon entering each substation, and after passing the high-tension switchboard, are conducted to two sets of three 175-kw delta-connected air-blast transformers, where the voltage is transformed from 6,000 to 375 for use in the rotary converters. These transformers are cooled by a blower set consisting of a i-hp induction motor direct-connected to a steel-pressure blower. The high-tension switchboard consists of two blue Vermont marble panels, in each of which are mounted a horizontal edgewise voltmeter graduated to read to 8,000 volts, and the switch handles. The switches, which are of the oil type, are placed in brick compartments, located some distance behind the marble panels. These switches are arranged to trip on an overload by means of relays, a red lamp placed in the front of the marble panel indicating when the switch is open. The 600-volt switchboard is of the ordinary railway type, built of blue Vermont marble, and provided with astatic instruments, circuit breakers, etc. In each battery room is located a storage battery built by the Accumulatoren-Fabrik Aktiengesellschaft, Berlin, and consisting of 280 cells. Each cell contains 10 negative and 9 positive plates, and is made of wood lined in the inside with sheet lead. The cells are mounted on a wooden platform, built up of three 11-inch hardwood timbers, placed on edge and floored over. This platform is insulated from the floor by glass blocks, and each cell is insulated from the wooden platform by porcelain insulators, four under each cell. The guaranteed capacity of each battery is 500 ampere-hours. The charge and discharge of the battery is regulated by means of a differentially-wound 50kw booster direct-connected to a 100-hp multipolar motor running at 900 r. p. m.
The Sydney and Suburban tram system comprises about 145 miles of track, and operates 527 cars. In the center of the city along George and Harris streets, center pole construction with double bracket arms and cast-iron ornamental bases set in concrete, is used, while all other parts of the city have span wire construction using both wood and Mannesmann steel poles. The track construction consists of grooved girder rails weighing about 83 pounds per yard, laid on concrete foundations with a wood block roadbed. Both Brown plastic and Washburn & Moen solid crown bonds are used for bonding, together with copper cables .45 square inch cross-section, laid between each track and bonded to alternate rails. These cables are laid against the inner rails of their respective tracks, and the two tracks are cross connected every 60 yards. The trolley wire used is of figure-eight section, about 0.13 square inch in cross-section. Two types of cars are used, one of them being built by the Brill Company, while the other is built by the Clyde Engineering Company, of Granville, Australia. Both Peckham and Brill trucks are used, while the cars are braked by means of the Christensen air brake, the desired amount of compressed air being secured by means of a compressor placed upon the axle and operated by the rotation thereof. The entire system is under government control, and is operated by three commissioners appointed by the Premier of New South Wales for a term of seven years. The manner of collecting fares is that in use in most European cities, and consists in dividing the city into sections, a charge of a penny (2 cents) beng collected for each section traveled over. Different colored tickets are issued by the conductor for the various sections, the passenger either paying for one section at a time, or he can pay for the entire distance he wishes to go at once. Each ticket is numbered, and inspectors are likely to inspect each passenger's ticket at any time, thus reducing the chance of dishonesty to a minimum. Sydney can now boast of having the largest electric tram system in the southern hemisphere, and I may add that it is expected to double the equipment in the near future.